NEW YORK - July 21, 2018 - PRLog -- According to the American Sleep Association, 50 to 70 million adults in the United States suffer from sleep disorders. One hypnotherapist hopes to change this through a new series of short, powerful audiobooks, the first of which is now available. "Sleep Now! : Self Hypnosis Meditation. Get to Sleep in Under 14 Minutes!" by Sandy Ames, C.Ht. skyrocketed to the top spot on Amazon's New Releases list shortly after its release. The audiobook is available for download on Audible and iTunes for under $3, or free to new Audible users. Sleep Now offers a simple and instant cure for anyone over the age of 6 who has trouble falling asleep or staying asleep. 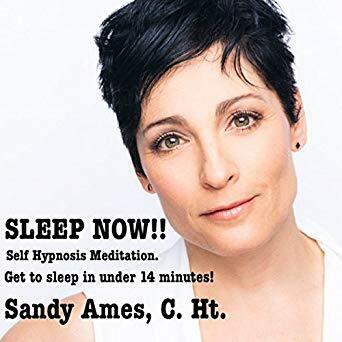 Written and narrated by a broadcast journalist turned certified hypnotherapist, the audiobook details information about how to sleep instantly and effortlessly, without drugs. Listeners can simply lay down and listen. Among the benefits of a better night's sleep are stress reduction, weight loss, improved energy levels and increased happiness. Warning: Sleep Now isn't safe for listening while behind the wheel or at work. Anyone who listens at work should close their office door first. "Sleep Now is best book that ever put you to sleep," Ames said. "When I first released Sleep Now through my personal social media, friends and long-time clients were buying it up, calling me, and saying, 'OMG I just downloaded it on Audible. I'm at work. But I was excited to hear what you did, and I woke up hours later!' Sleep Now works." Reviewers are giving the new audiobook five stars and citing the book's success in helping them finally get the sleep they need. "I was admittedly skeptical of trying this - but it worked for me when nothing else did," wrote one Audible reviewer. "Usually I can't stop my mind from racing at night, but l have actually been sleeping well for the last few weeks. Definitely recommend it." "The feedback has been incredible," Ames said. Sandy Ames is a Certified Hypnotherapist from the only fully-accredited hypnotherapy school in the United States, The Hypnosis Motivation Institute (HMI). She holds degrees with honors from Florida State University in both psychology and communication. Featured on NBC's Today Show, Ames is a specialist in public speaking and healthy lifestyle issues and has spoken to a variety of audiences on hypnosis and meditation. She is also the creator of the first-of-its-kind hypnosis and yoga program. Prior to working as a hypnotherapist, Ames was a broadcast professional and voice-over artist for more than three decades, with experience doing voice overs for national campaigns and hosting radio and television shows. Ames can currently be heard on iHeart Radio's WLTW, 106.7 Lite FM as the voice of Jamie Lee. She is a single mom living on New York's Upper West Side. Learn more about Sandy Ames at SandyAmesHypnotherapy.com.